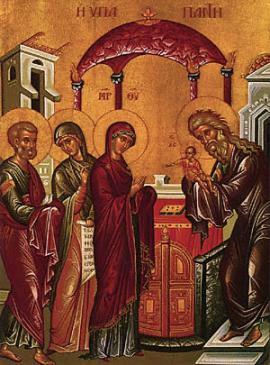 Forty days after His birth in the flesh, Christ was presented at the Temple in accordance with the legal prescription of the Mosaic law that required a purification of the child and mother after birth. Yet, this was not a purification in the strict sense since neither Child nor mother were in need of cleansing. And because there in the Temple He was received by persons moved by the Spirit, and especially because Symeon took Him into his arms, this feast is also called a Meeting. The title "meeting" provides a clue as to the feast's spiritual significance. In one of the canons of the Afterfeast of Theophany it is written, "The forerunner teaches that it is not possible to loose the sandals, the bond between the Word and us, of Him Who delivers mortals from deception." The bond between the Word of God and us was forged in the Incarnation and strengthened through each and every blessed event of His human life. In His obedience to the Mosaic law, He destroys the disobedience of the first Adam, thus making a path forged in obedience back to the Father's house. This is precisely why the feast is called the Meeting of the Lord rather than the purification or presentation. What takes place at this blessed event is the culmination of the Old Testament as the New Covenant irrevocably binds us to Christ Himself. As is true in all things concerning the Divine Economy, the acts of the Almighty must be met with a corresponding human response on our part. For that, we need only look to Saints Symeon and Anna. As Metropolitan Hierotheos Vlachos writes, "According to Saint Athanasios the Great, it is our task to liken ourselves to righteous Symeon and the Prophetess Anna. We too must meet Christ with wisdom, purity, guilelessness, forgiveness, and in general with love for God and mankind. No one can meet Christ, the true life, in any other way. ...Then the feast of the Meeting of Christ also becomes a feast of the meeting of every believer" (The Feasts of the Lord, pp. 93-94). May the thrice holy God Father, Son, and Holy Spirit, illumine you and keep you firmly in the love of Christ!